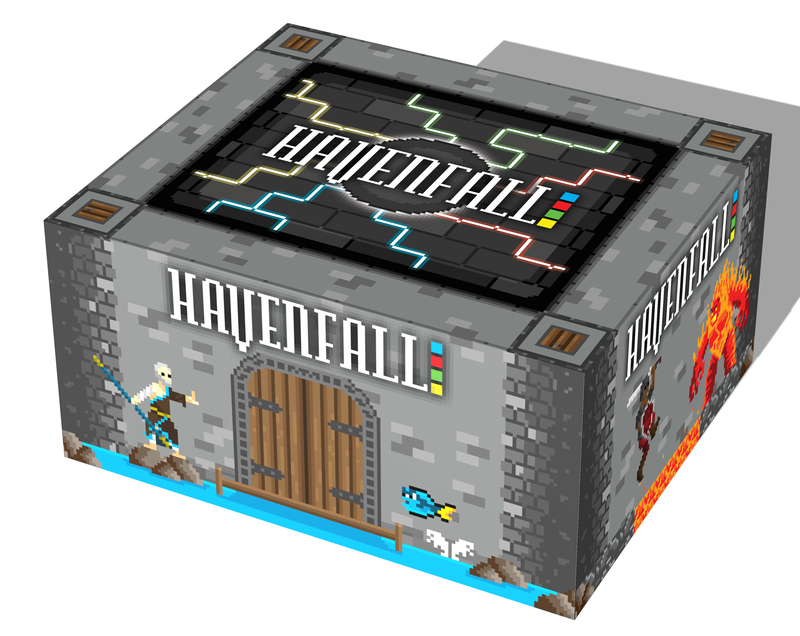 Havenfall is an 8-bit adventure deckbuilding game set in the land of Edonia. 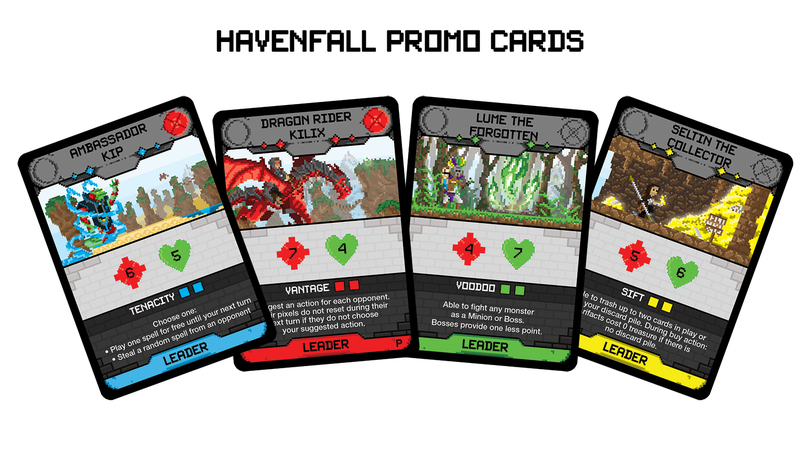 Through the game, players battle monsters and gather pixels to enhance their deck in order to claim victory as the savior of Havenfall. The 4 optional Promo cards are only available during this first print run of 500 copies. These are not required to play the game, as they are additional choices for Leader cards. Customer has 24 hours to cancel an order. If the customer wishes to cancel the order while it is in the shipping process, the customer is responsible for ALL applicable shipping fees. A refund on the product will not be granted until the product has been returned to the seller unopened and undamaged. Import duties, taxes, and charges are NOT included in the item price or shipping cost. These charges are the buyer’s responsibility. For questions regarding these costs, please check with your country’s customs office. *During sample tests the game printed fine, but our first run game back with a lower resolution image on the back of the box. Everything is still legible, but this is an issue we are aware of and will fix with future print runs. *Correction: The quantities for Silver and Gold are listed incorrectly on the dividers for the Silver and Gold. In the rule book it says 12 Silver and 8 Gold. Those are the correct amounts in the game. Each game has the correct amount of cards included. 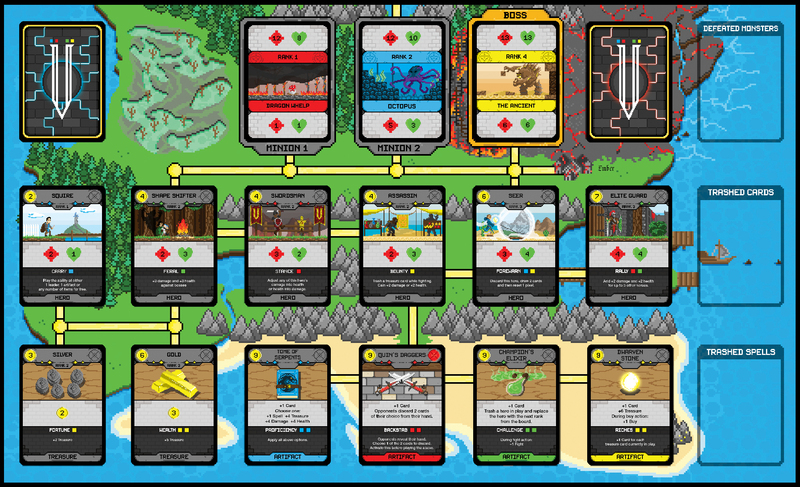 *Rulebook Update: We have updated the setup for Monsters at the start of the game. Instead of all three monsters can be ranks 1-4. The new rule is Minion 1 and 2 can be ranks 2-3, the Boss can be rank 1-4. I picked up a first-run copy of Havenfall after doing a playtest at a convention. It draws crowds whenever I play a round at my college library, and is fast paced once all the players there know what they’re doing (will take at most half a game on average, with rounds going from five to eight minutes for four people to less than two). The mix of investing and careful management of opportunity cost is the main component of the game, and it really revels in that. Havenfall has incredible replay value, as only one configuration of heroes is used per game- there are somewhere around 50,000 legal card combinations for heroes* and when combining this with the four different starting leaders and the tendency of the deck to make certain pixels scarcer than others, it’s easy to say that you’ll probably never play every possible variation of this game. Mechanically the game is simple to pick up and very fair. Randomness is used to keep things fresh, but the use-then-shuffle system employed in the game makes it so that no one gets an unfair advantage from dumb luck. At the same time, your choice of hero or investment in future gold can more often than not be the difference between victory and defeat. Add to this the affinity of some leaders to excel at certain points in the game, and you now not only have to worry about fighting, but about how quickly you can end the match, or how and when to draw it out to diminish your rivals’ power. Spells are varied and well balanced, and the entire experience is gripping and highly polished. 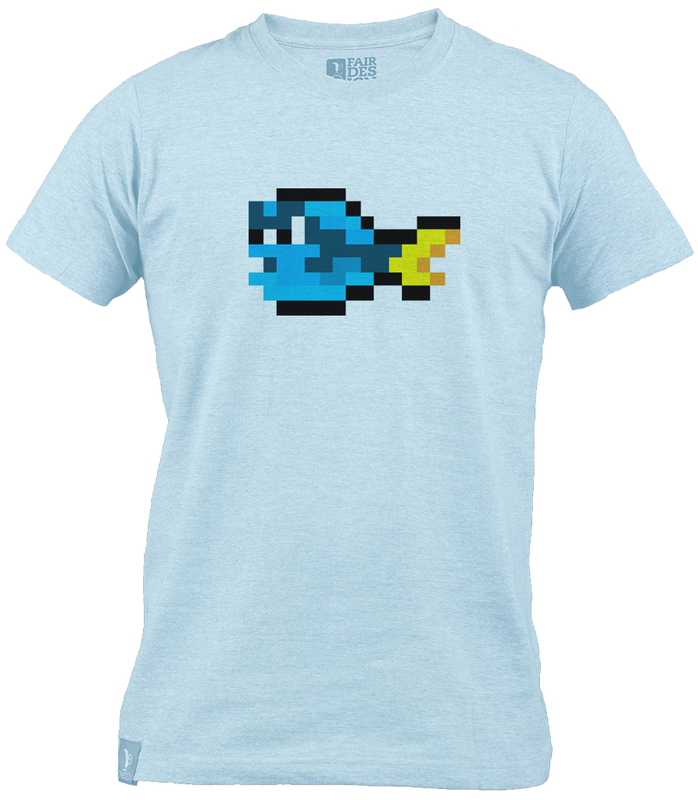 Graphically, Havenfall is styled in the “I like retro graphics but have no idea how they worked” school of pixel art, with 64 to 32-bit color palettes and definitions ranging from 4 to 8 bit. It shares in the same downfalls as much of the same art in this category, but the backgrounds are head and shoulders what the style generally results in, being well detailed and making the cards very visually interesting. The game and components are high quality in a material sense, although the box I have (which is a prototypical one, to be fair) scuffs incredibly easily, and the box itself is a strange rectangular shape which refuses to fit into nearly any container I’ve tried, meaning the box will need to be packaged and protected for transport, or else the thing could easily be ripped up and dump your cards out. Text on the base of my copy is blurred and low definition. There’s also a slight vacuum effect on the box lid, for those of you who are off-put by that. Overall, this game is astoundingly fun and very interesting, relying on strategy and decision-making with a hint of luck, just like a classic JRPG. *((6 heroes per color) Choose (2 pixels represented, minimum) = 15, 15^(4 pixels) = 50,625, less multi-pixel card conflicts). Hey, glad to hear you enjoy the game!!! 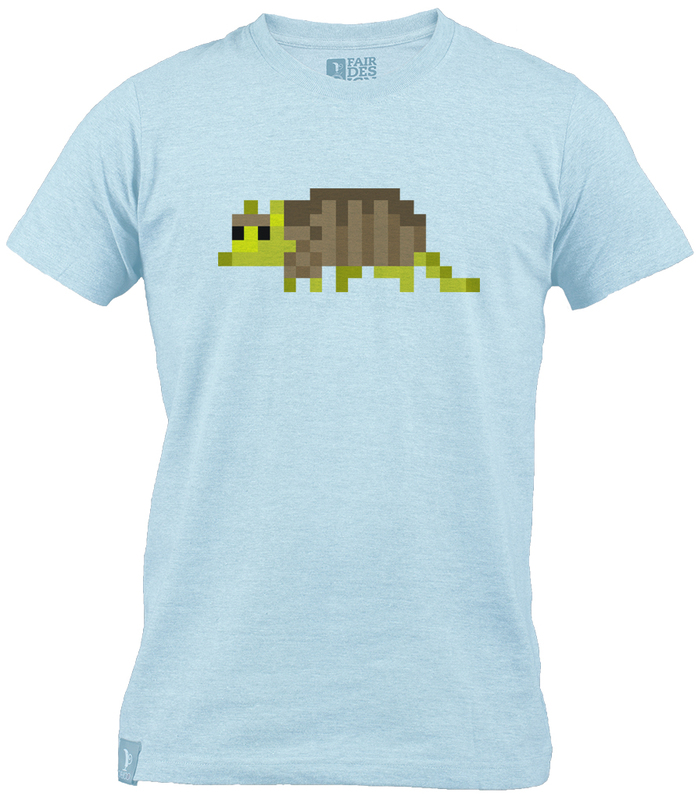 Its funny you mentioned the 8-bit artwork color palette, when I first started the artwork. 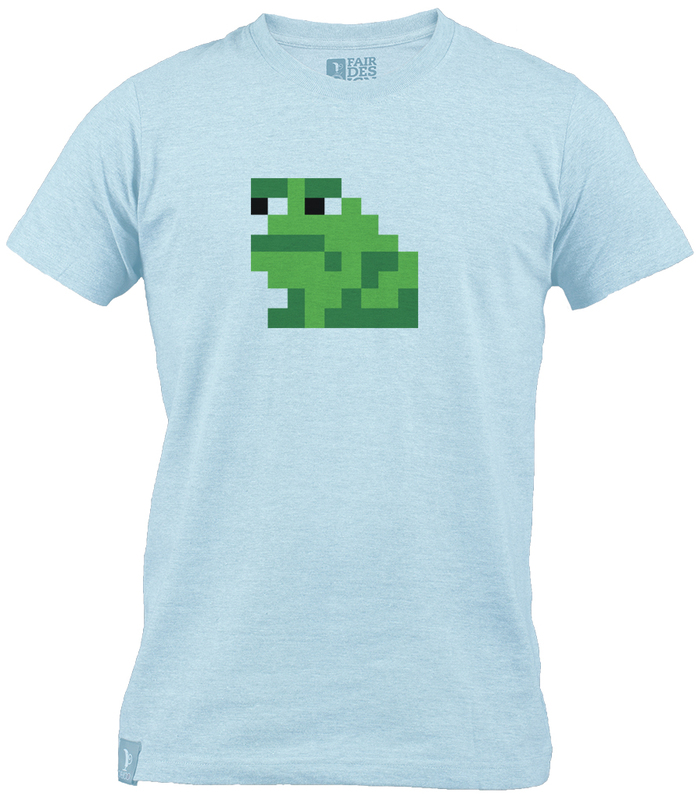 I was only using the NES color gambit, but with that there is no actual yellow, just browns. So I couldn’t really use that as a reference since there was a yellow playstyle in the game. The other issue was using the NES colors were too vibrant for print, so I had to tone some of them down to enjoyable colors, the blue and green used to awful to look at. The back of the box was a big issue that we did not see coming, our first 3 print samples from the factory all looked correct, and then when we got the first 50 delivered they had that issue and it was already too late. We just kind of dealt with it as the back doesn’t affect gameplay. The box is the one thing we will look at touching up if we do another print run! 😀 Thank you for voicing your concerns about it! I did the math if you add in artifacts to the mix of heroes and there are 350,000 different card combinations to setup. I found out about this game on Tabletop Simulator just by random chance. I enjoyed it enough to play it a few more times and actually got to play with Joe. He is very patient and likes to get more people into the game. You can tell he has poured his soul into this game. I was so excited to find out a physical copy was obtainable. I got my copy fairly quick with no damages. I have spread word to everyone I know about this game. Plan on getting this as a gift for someone who actually is borrowing my copy lol. Ants I highly suggest getting this or if you just don’t have the money then play it on Tabletop Simulator and spread the word! I was introduced to Havenfall at the Carnegie Library’s International Tabletop Game Day event this past weekend. I’m pretty new to deckbuilders and was kind of mystified by the gameplay for a little while; once I got the hang of it I really enjoyed it! Glad to see there’s some game makers in the Pittsburgh area. Hope to play it again soon! !